At one point or another, a good chunk of society has dreamed about starting a band. Like the dreams of being an astronaut or a professional baseball player, the allure of becoming a musician beckons at us, whispering promises of greatness in our hopeful ears. At one point or another, a good chunk of society has dreamed about starting a band. Like the dreams of being an astronaut or a professional baseball player, the allure of becoming a musician beckons at us, whispering promises of greatness in our hopeful ears. While the path to Major League Baseball can take years to achieve that dream, starting a band can be as simple as talking to your friends. But why do people dream of playing music? Well, the answers can vary from fame to trying to pick up girls with a guitar. For some, they just want to rock. Andrew DeSanctis started officially rocking in the fall of 2008, when he, his sister Clare, and two others started Perdition, a European-influenced death metal band located here in Erie. Over the past four years, the band has toured across Pennsylvania, Ohio, and New York, including at the crooked i, where Perdition will take the stage Tuesday, Aug. 21. 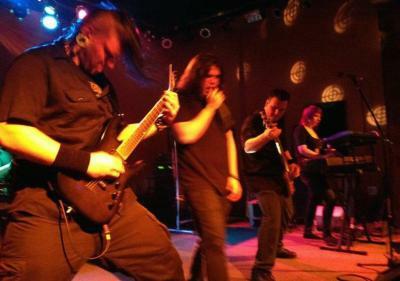 While Perdition was born before DeSanctis even set foot on a college campus (the guitarist now attends Gannon University), the band made it a priority to continue growing both in terms of musicianship and fan base. "I grew up in the Erie scene around other bands that were relatively unsuccessful beyond their musicianship," DeSanctis said. "Because of this, we decided on day one to establish our band as a business-first operation, concentrating our efforts to create a source of entertainment that would be far more than just live music." In order to establish Perdition as a metal mainstay, the band took to the Internet, creating a presence online to spread awareness, although constant changes in the group's lineup threatened to derail its success. "It has been a long haul since starting the band and writing our first few songs," DeSanctis said. "Clare and I are the last remaining original members. Because of this, we have matured in our sound, having experienced so many influences, and now have a very melodic death metal sound. We incorporate guttural vocals and very technical melodies, harmonies, and drum and piano arrangements. We like to think of ourselves as 'Symphonic Death Metal' due to our melodic writing that really raises the bar above typical metal." While some people are frightened off by the metal genre, Perdition has something to offer different crowds, be it the brutal subject matter, the fun stage antics, or the technical ability of the six musicians on stage. Some people may start a band for the fun of it, but DeSanctis has a philosophical connection to the band as well. "My personal ideologies really are a part of the meaning of the name," DeSanctis said. "I believe that it is every human being's duty to question faith in religion, government, society, etc., and whether we are condemned for our choices of appearance or beliefs by others or not, we should remain true to our decisions and pursue what makes us happy or intrigues us, regardless of what we are told is taboo." For DeSanctis, Perdition is more than just a band he started. Perdition is an ideology, a business, and ultimately, a dream that came true.